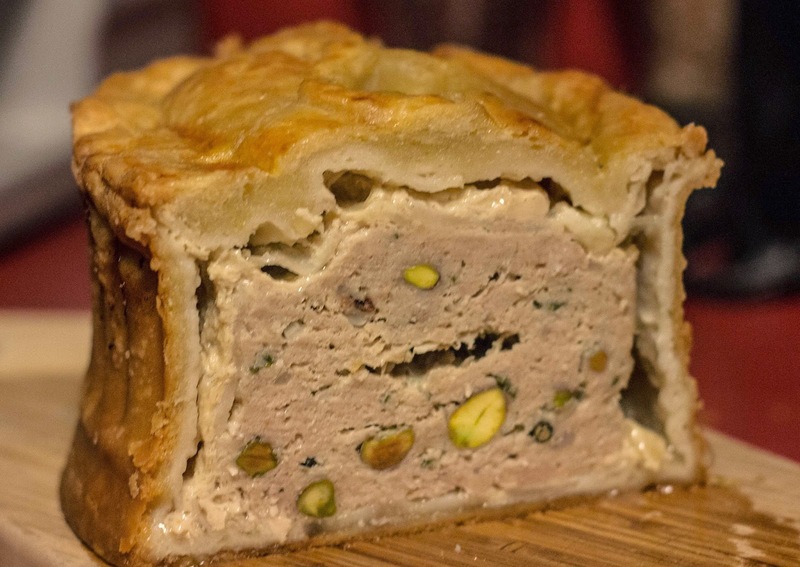 I'm sure lots of people say this: I love making pie crust, and I love making pate, but I'm always intimidated by pate en croute. You'd think just wrapping a pie crust around ground meat would be easy, but for some reason I always worry that the entire thing is going to collapse in the oven (despite the metal frame around it) or start bubbling up its filling like a boiling cherry pie. Putting these irrational fears aside, I decided I wanted an eye-shaped mold for Christmas one year...despite the fact that I already have a rectangular metal one, along with my regular ceramic terrine for croute-less pates. My mother, who loves the odd and esoteric (and thus my rank as favorite child), picked me up this beautiful one. Unlike a regular mold, this has fluting down the side for extra visual appeal. Otherwise, it's the same as a regular rectangle mold. The sides come off in two pieces, so you can lift them away and then gently slide out the bottom. To line the pate with a butter crust, you just roll out a rectangle of dough, paint two sides of the dough with egg wash, then pinch it together to make a pouch. Lay the pouch inside, and then press it up against the sides to help it take the form. 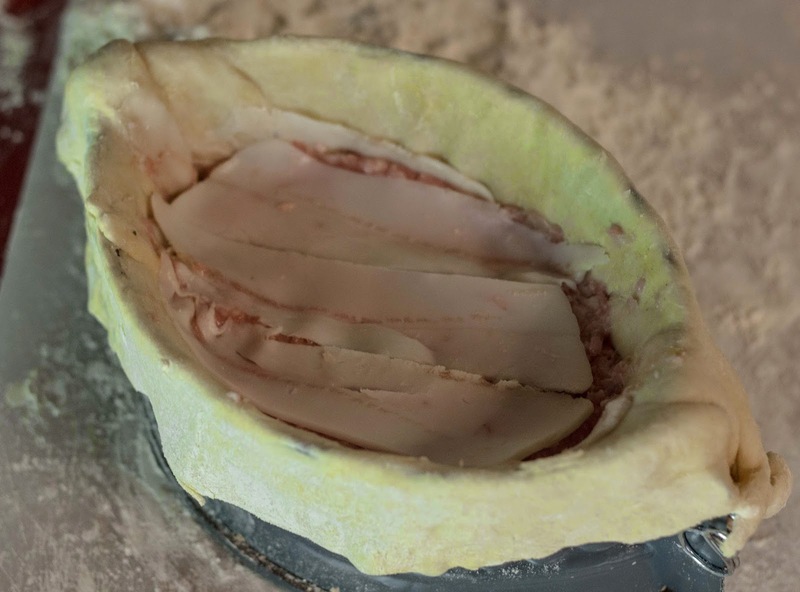 Traditionally the dough is lined with slices of fat back. Cookbooks say this is to "seal the dough," but I have my doubts. Back fat doesn't seal like a membrane casing, it just renders out fat. I wonder if this is actually to seal the pate by coating the outside of the meat filling with melted fat. This would protect the meat from exposure to oxygen, and possibly extend the shelf life. 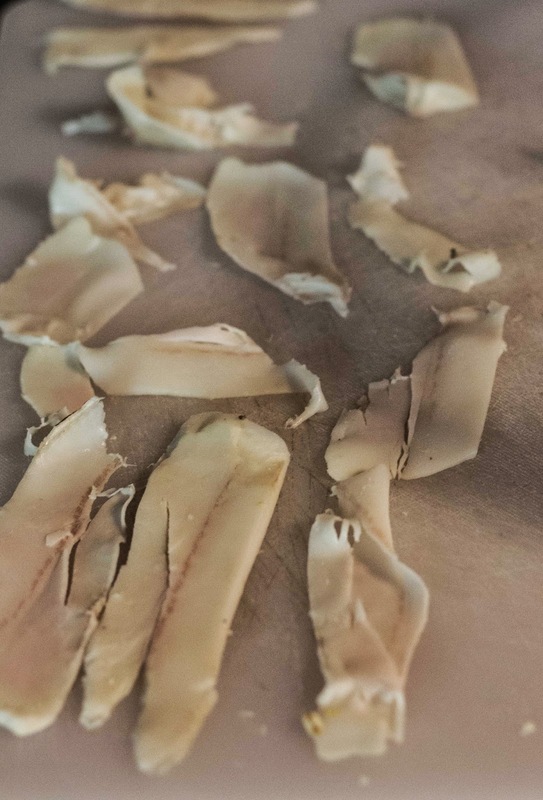 That explanation sounds plausible, but perhaps people did think the backfat sealed the dough, such as the old myth of searing meat as a way to "lock in juices." Either way, I sliced up some back fat and shingled the sides and bottom. 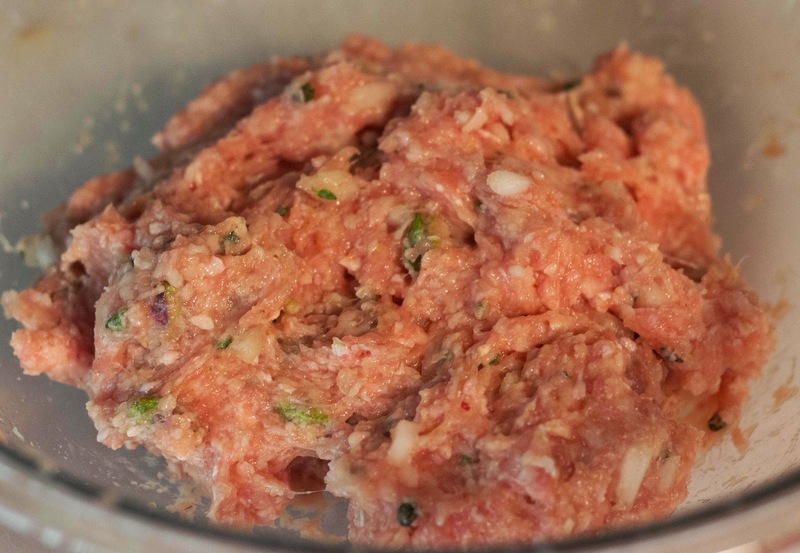 Then the mold was filled with ground veal mixed with cream, brandy, lemon zest, thyme, mace, beaten eggs, minced onion, and studded with pistachios. Despite the mold looking small, I underestimated the amount of force meat needed (I used 1.25 lbs), and this could have easily held an extra half-pound of filling. That would have made for a prettier, high-rising pate. After topping up the pate with sliced back fat and laying a crust on top, it was ready for the oven. I made a small hole in the center of the top to let the pate vent any steam from the inside. 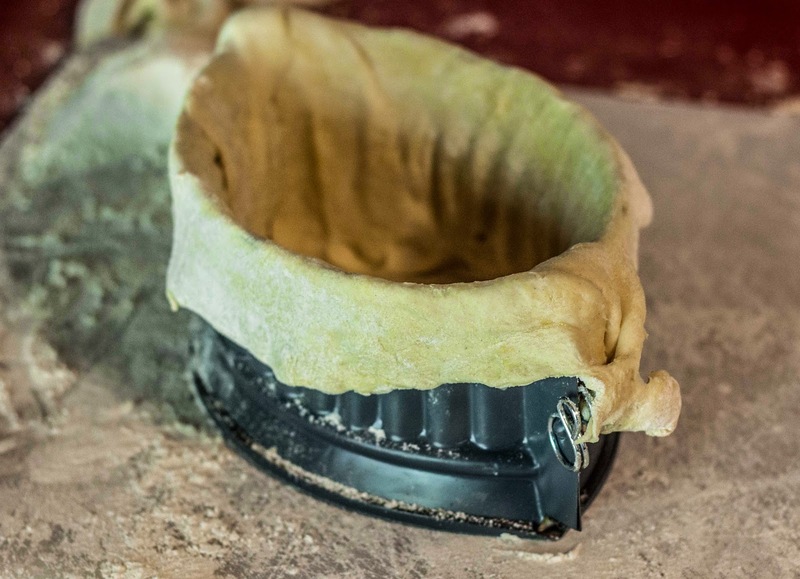 Since the mold does not have a water-tight seal, it goes in the oven without a water bath. Plus, the dough would never brown in a water bath. 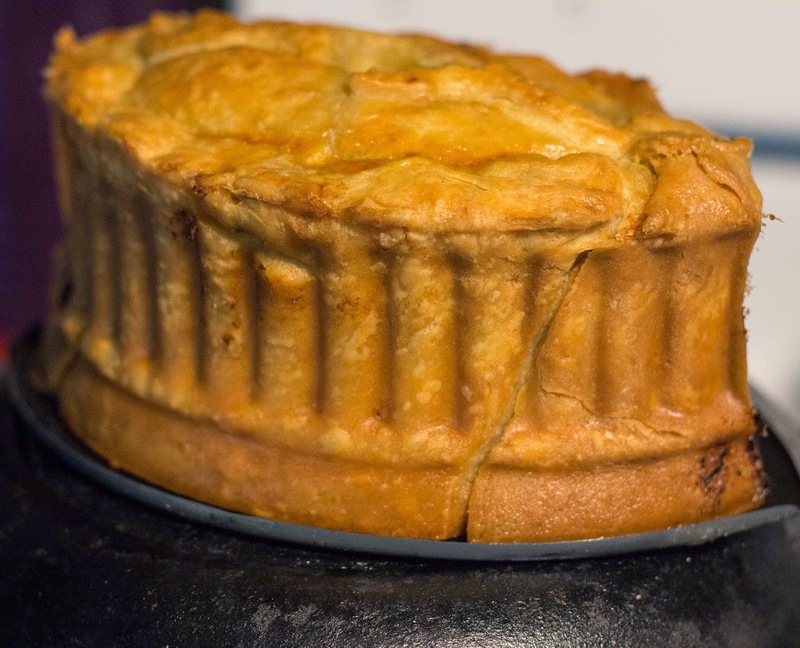 I have seen recipes for pate en croute where you make a pate in a ceramic terrine, bake it in a water bath, let it cool overnight, then remove it from the mold and cover it with pastry and bake again. This gives you more control with the first baking of the pate, but I worry you'd end up overcooking it the second time when baking the newly applied crust. I might try it some day to see if it's worth the extra fussing. 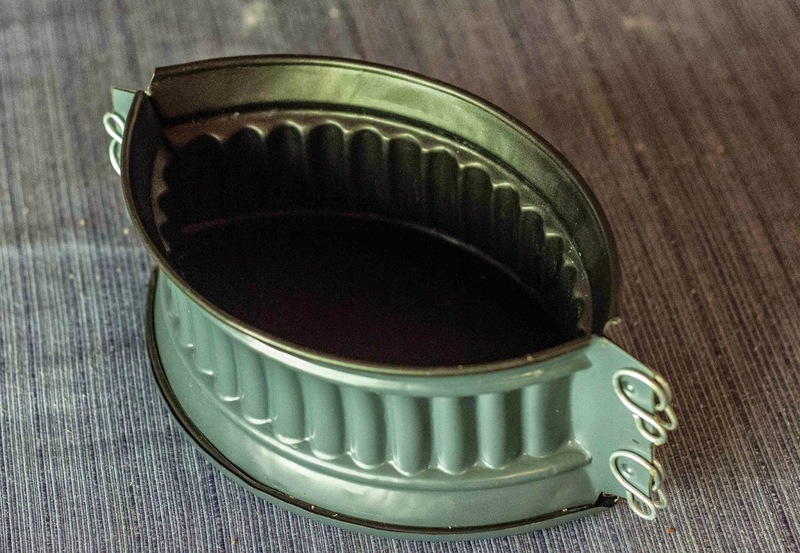 Clicking off the metal snaps, I was thrilled to see the beautifully browned crust. Unfortunately there was a fold in the dough that either I missed initially, or created when I was packing in the filling. A small mistake, but it created a long, scar-like crease down the side. Cutting through the buttery dough, the inside was fragrant with the warm smell of mace and bright aroma of lemon zest and thyme. Some people would pour a gelatinous stock inside the pate before cutting. This will fill in all the cracks between the meat and crust, giving you another layer of flavor. I don't bother, as Carla's not a fan of meat jelly and I'm happy to skip the work of slowly funneling in stock and hoping your crust doesn't spring a leak before the jelly sets. When I got to the middle, I saw the second disfiguration of the pate. There was a gap in the dead center of the pate, right below where the vent was cut in the pie dough. Perhaps the pate baked too fast and the meat steamed apart, creating this bubble? I'm not really sure. The pate tasted delicious, though. It was the perfect balance act of light flavors (veal, lemon, herbs) offsetting the richness of the buttery crust and surrounding backfat. Still, those two superficial errors nagged at me. I think that's the root of my apprehension with a pate en croute. I could easily serve a pate with a loaf of bread. But to wrap the pate in crust is simply to make it look elegant and beautiful. Then, when it turns out to be marred in some way, even if the flavors are wonderful, you can't feel completely successful.